You would have to be living in deepest outer space not to have noticed that the NHS is changing. Indeed Sir David Nicholson, Chief Executive of the NHS has famously gone on record to say that the changes are so big they can be seen from the surface of Mars! So what will this mean for kidney care and what will it mean for kidney patients and there families? Health care professionals will see the changes to the structure of our health system and feel the financial challenge. Patients will want us to deliver on the quality promises. The causes and consequences of kidney disease will of course remain unchanged over this short political timescale, the opportunities for improvement - to make a difference for individual patients hasn't changed. They have in fact been given a high profile by the relentless focus on quality as the only organising principle of the NHS. The pendulum is swinging from a predominantly hospital led approach to one that puts more emphasis on primary and community care. Kidney disease, and I include much of the acute kidney injury in that, has the features of a classic long term condition. As such, much of what we, the kidney community, want to do and achieve are high NHS and government priorities. Long term conditions rarely occur in isolation. That's also true for kidney disease - often complicated by hyper-tension and vascular disease, or the results of conditions such as diabetes. Let's also not forget the high incidence of that treatable, but often unnoticed and at times neglected condition, depression in our patients. We know many of the risk factors for kidney disease. Clinical trials have identified some of the ways in which we can modify and sometimes even halt progression. Here in this second decade of the 21st century the individual stories of people starting dialysis often tell of missed opportunities to prevent kidney disease. In 1 in 3 patients who develop AKI it was both predictable and avoidable - good basic care of the acutely unwell can prevent AKI. There are now over 2 million people in the UK on primary care, CKD registers. Kidney disease is now recognised as a common, harmful and treatable condition. It is as much the province of the generalist and acute teams as the renal multi-disciplinary team. The better early detection and management of CKD using the principles and tools of chronic disease management, a big focus of our NSF, the fewer the missed opportunities to prevent or slow down the development of complications in people with kidney disease. The whole NHS system is being aligned to the outcomes framework. This sets 5 high level goals – reduction of avoidable mortality, improvement in long term conditions, better recovery and rehabilitation, patient experience and safety. 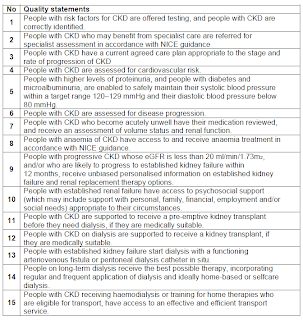 Each of these domains of the outcomes framework is relevant for people with kidney disease to a variable degree depending on there place along the pathway and their individual circumstances. We must now consider quality of kidney care, delivered in your ward, renal unit, out patients and at home under these 5 headings. 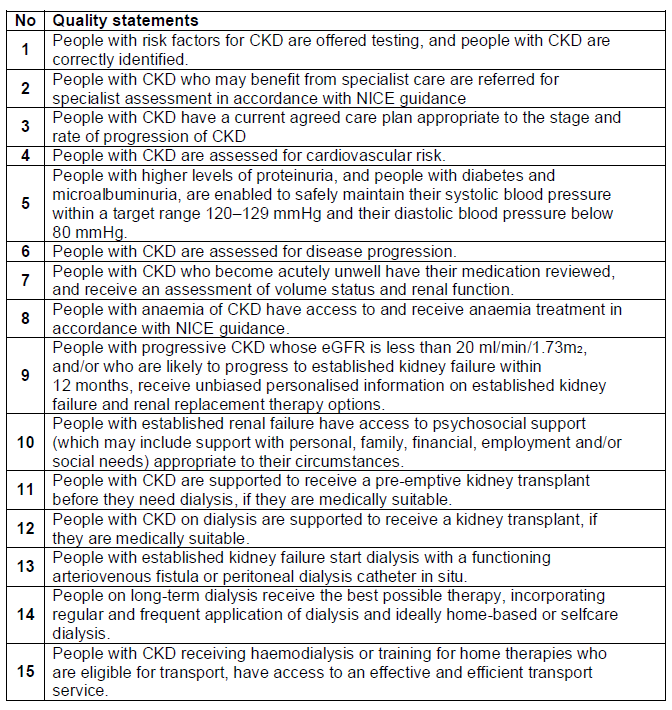 The NICE Quality Standards for CKD provides the detail of what we must measure for the population each kidney unit cares for, but it is the individual experiences and outcomes from every encounter between your patients and the care teams that is really important. And it is not just the clinical context – it is as much about the respect that we show and dignity we give. Quality also means helping our patients in what is often a chaotic and confusing system. Chaotic care leads to missed opportunities, unnecessary expense and poor outcomes. A man from Whitehall isn’t going to sort out chaos for us. More likely a woman in clinic, on the ward, or from the social work team can help our kidney care multi-professional teams improve our own local systems. We are the system – our culture, values, attitudes and behaviour determine the quality of patient experience and even the clinical outcomes. There is now good evidence that the better teamwork and better quality care plans, results in less hospitalisation and lower mortality for dialysis patients. What are the benefits and possible risks? How likely are these risks and benefits? And we should be prepared, that might need training such as role play to answer these questions honestly. You can start that tomorrow. Over the next year getting the preparation and choice for renal replacement therapy right for as many patients as possible remains one of my key priorities. The NHS Kidney Care programme to support care planning and timely transplant listing is providing a stimulus for improvement. I also expect that shared decision making tools such as personal decision aids be available online, and/or with individual coaching will be with us soon. These will become a standard feature of our advanced kidney care clinics and multi-professional team working. But don’t wait for that to put the next patient you see right at the centre. Dignity day - what are you doing about it?